e year 1819" (Ibid, 283). This is one of the most beautifully situated bullaun stones I have come across. 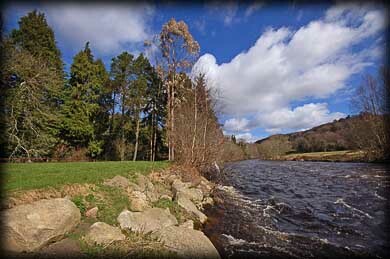 The stone stands between the meeting point of the rivers Avonbeg and Avonmore, which is considered a local beauty spot. 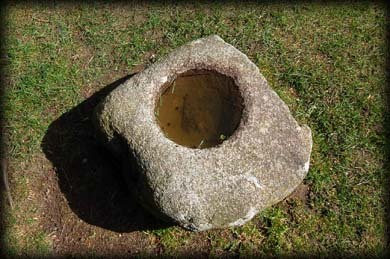 The stone is approximately 60 cms in length by 50 cms wide and roughly 40 cms high. It also appears to been broken or hewn at one end. As you can see from the images there is a single large bullaun about 30 cms across. 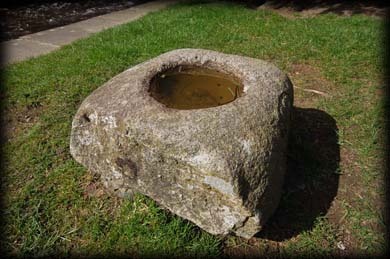 The stone is thought to have been brought here from Sauls Fort, a small ancient mound or Fort at Lower Ballinderry, in the Parish of Rathdrum. A view from the bullaun looking up the Avonmore River ( Irish:Abhainn Mhór, meaning Big River) The meeting of the waters is celebrated in a song by Thomas More. Situated: From Arklow take the R747 towards Woodenbridge, then turn left onto the R752 and drive north passed the town of Avoca. Keep going north till you reach the meetings public house. Follow the signs for the meetings. Discovery OS Map 62. T 1895 8305. Last visit April 2010.